The Cub Scouting colors are blue and gold. They have special meaning, which will help boys see beyond the fun of Cub Scouting to its ultimate goals. The blue stands for truth and spirituality, steadfast loyalty, and the sky above. The gold stands for warm sunlight, good cheer, and happiness. 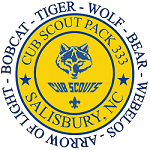 Consisting of the Wolf, the words “Cub Scouts,” and a fleur-de-lis, the emblem represents the Cub Scout helping the pack go and the pack helping the Cub Scout grow.